Leading the international mobile material handling market, Telestack supplies some of the largest blue-chip companies in the world. 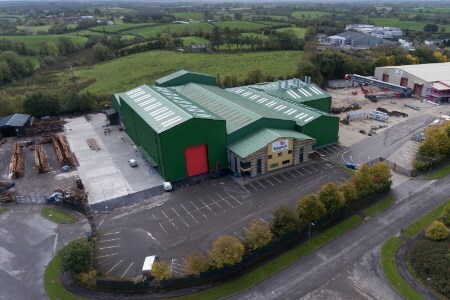 Designed, manufactured and exported from its current 105 000 ft2 manufacturing facility in Omagh (Northern Ireland), Telestack plans to extend its manufacturing capacity by initially building a phase one 45 000 ft2 factory on a greenfield site close to its current facility, which will incorporate state of the art manufacturing premises, a dedicated Research and Innovative Development centre and modern office suite – all of which is central to its continued growth strategy. The engineering acumen within Northern Ireland is renowned globally, and the expertise within Telestack has grown and developed significantly over its 34 year tenure. In addition to the company’s aggregate and mining group, Telestack has matured within another material handling niche in the ports and inlands terminals sector, designing and manufacturing equipment to load and unload dry bulk onto vessels up to panamax/post-panamax. Its equipment is involved in some of the most ground-breaking, exciting and forward-thinking projects across the globe with the company gaining serious traction in other industries such as the rail, power, cement and steel plants. Employing almost 160 local people, Telestack has demonstrated enviable year on year sales growth with sales more than doubling in the last three years. Telestack, in the last two years alone, has invested almost £4 million in its current Bankmore site with a state-of-the-art shot-blast, two paint booths and an additional manufacturing facilities, which have all contributed to its impressive sales and operational performance. Managing Director Martin Dummigan explains what the local investment means for Telestack and the people that they employ: “Telestack has grown rapidly over the last number of years and we have firm plans to double our revenue again in the next 3.5 years. We have out-grown our current facility and we need to extend our manufacturing footprint to meet the international demand for our products. We have made a conscious decision, even in the face of Brexit uncertainty, to invest locally. We have a unique skill base in Omagh and we need to protect Telestack’s engineering acumen. The marketplace has become somewhat flooded with companies who try to copy our designs but you simply can’t buy experience. For want of a better cliché you have to earn your stripes. Telestack’s international portfolio is vast and varied, and with over three decades of experience, the company certainly does not shy from the complicated or intricate. Telestack recently designed and manufactured the largest international mobile bulk reception feeder in the world and the unit is currently loading aggregates onto barges for a large American multi-national corporation at loading rates in excess of 14 000 tpd. Telestack has also recently installed a unit as part of the multi-billion pound Thames Tideways Tunnel in London. Tideway are building a major new sewer under the River Thames (named the ‘super-sewer’), which is urgently needed to stop millions of tonnes of sewage overflowing into the River Thames. At 15 miles long, 7 m wide and up to 65 m deep, the Thames Tideway Tunnel is the biggest infrastructure project ever undertaken by the UK water industry. The Telestack unit will be at the end of the tunneling process to load the tunnel clay onto barges fed from a fixed conveyor. Telestack is currently completing the installation of a £5 million pound system in Oman for the Port of Salalah. The equipment will be another ‘global first’ in terms of innovation, providing a unique shiploading system to handle the additional capacity needed by the port. The four unit installation comprises of two shiploading systems, each suite comprises of a TB60 All Wheel Travel Shiploader fed by a Titan dual-feed All Wheel Travel 800-6 Bulk Reception Feeder and represents the new generation of mobile shiploading, offering all of the performance of traditional systems but with the added benefits of mobility, flexibility and ultimately a lower cost per tonne achieved by increased production rates, reduced cycle times and reduced labour costs. The equipment is designed to load limestone, gypsum and cement clinker at average rates up to 1200 tph to handymax, panamax /post-panamax vessels. Telestack began discussions in 2013 with the Port of Salalah technical and operational teams to design a customised shiploading system as part of an ongoing US$15 billion infrastructure investment to cater for the export requirements of its local mining, quarrying and cement industries. The company opens 2019 with its largest order book ever as it builds on the successes of 2018. This includes projects for Africa, the US, South America, Europe, Russia and Asia to allow 2019 to continue the global penetration of prior years.